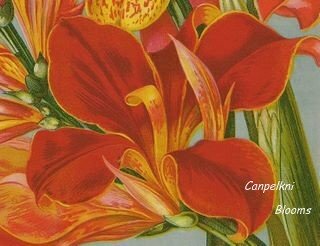 The canna Star of 1891, and a description for this very grand canna that was obviously very popular in it day. It was raised in America. In 1892 an award of merit was given to this plant. This year there has risen in the horizon of the floral world a star which will shine brightly in all future years. A very dwarf canna which will show bloom everyday in the year, its flowers being borne in great compact panicles often as large as a man’s hat and of the most intense fire scarlet color rayed and bordered with pure gold is a novelty of more beauty and value has been seen for many years and entirely new departure, a new garden flower and a new perpetual blooming pot plant of unsurpassed grandeur in short the Star of 1891. History of this plant reveals the plant was raised from Crozy prized seed by Mr. Caitlin of Virginia in the USA. Its great novelty and beauty in habit of growth and large sized and brilliant color and perpetual blooming habit prompted him to send it to Mr. Wm Falconer the eminent and far famed gardener of Mr. Dana, editor of the New York Sun who tests all floral novelties from all parts of the world. Mr. F grew it in a pot over winter and its sized, profusion and brilliancy of bloom eclipsed everything. He pronounced this canna the greatest novelty of the times. Florists from all parts went to see it and papers have published glowing accounts of its marvelous beauty, so that even before it introduction its fame is worldwide. We finally bought the entire stock of it, only a few plants, for $800 and it now first offered for sale. It is very dwarf, not exceeding two or three feet in the open ground, and still less in pots. Its flowers are very large at 4 to 5 inches across and the mass of buds and blossom form a solid panicle. Its color is so bright and dazzling that it seems to illuminate the air around it. No matter how small a plant is the first thing it does after it is planted is to send up a flower stalk and bloom and this it will do without ceasing as long as it is cared for. The price for strong plants of canna Star of 1891 that were offered for sale in 1892 was 75c each. It was stated that they would commence blooming at once along with the notice that: No price reduction would be made to anyone on any account. Comments by Mr. Falconer: we have imported from Europe the finest dwarf flowering cannas that have been raised there and have also got together the best of those raised in America and in face of them all I have no hesitation whatever in pronouncing canna Star of 1891 the grandest flowering canna that I have ever grown or ever seen. The habit of the plant is very dwarf but with full fine foliage and it has a persistent habit of throwing up fresh sprouts from the base. Every sprout produces a flower spike which in its turn becomes many branched, each branch bearing from 12 to 17 blossoms, each of the blossoms 4 to 5 inches wide and each petal is one and a half inches broad. The color of the flowers is glowing orange scarlet faintly banded with golden yellow. And the plants from tiny morsels to big specimens are perpetually in bloom. Their brilliance is unsurpassed and as a house or green house or winter blooming plant it is going to cause a great sensation. It never ceases and blooming and its blossoms under glass are even brighter and longer lasting than they are out of doors. Even Poinsettias pale before them. Aside from its originator I have a more intimate knowledge of this splendid canna Star of 1891 than has anyone else, for I have had it since last year and grown it in the green house for its flowers in winter and planted outside in summer. W m Falconer. From Mrs Crosoey of Gableville Michigan, August 9th 1891, Star of '91 is truly splendid. The plant bought off you last spring has given me 45 perfect flowers and has two clusters of buds now. Mrs. W. S. Crosoey.